Anna was born in Cheboksary (Russia) and received her B. Sc. and M. Sc. degrees in Applied Physics and Mathematics in Moscow Institute of Physics and Technology (State University) in 2004 and 2006. She received her PhD in the Institute of Biochemical Physics of the Russian Academy of Sciences (IBCP RAS) in 2009. The thesis was related to the kinetics of the solid phase polycondensation of amino acids. During her postdoctoral stay in IBCP she has moved to the field of photovoltaics, namely dye sensitized solar cells (DSSCs) in the group of Prof. Oleg Shevaleevskiy (Moscow, Russia) where she was investigating the electrodes based on nanostructured wide bandgap semiconductors for DSSCs as well as tandem cells based on DSSCs. In 2015 she was engaged in the postdoctoral project related to the impedance spectroscopic studies of dye and perovskite solar cells in the group of Prof. Juan A. Anta (Seville, Spain). The main direction of the research was the investigation of charge recombination and transport by means of small perturbation techniques (IS, IMVS, IMPS). In 2017 she began her postdoctoral project in the group of Prof. Rene Janssen. 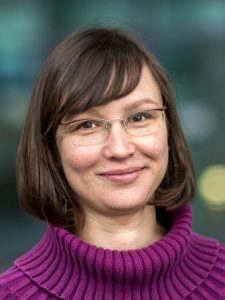 Her current research interest is related to the investigation of the influence of charge accumulation on performance of perovskite solar cells and role of selective contacts in accumulation of charge by means of impedance spectroscopy as well as electroluminescence and photoluminescence and other techniques.